KIM LAWTON: During his visit to New York last month, Pope Francis was part of an emotional interfaith service at the 9/11 Memorial. Representatives from more than a dozen religious traditions joined the pope to talk about peace and to pray for it. REV. DENNIS McMANUS (Georgetown University): Fifty years ago that would never have happened. One hundred years ago it would have been laughable and unthinkable, and 500 years ago we’d all be under arrest even from trying it. LAWTON: Rev. Dennis McManus assisted at the gathering. He’s a professor at Georgetown University and the US Catholic bishops’ consultant on Jewish Affairs. He says the 9/11 service—and all of the Catholic Church’s interfaith dialogue—can take place because of Nostra Aetate. REV. McMANUS: This document is big. It’s big of the way it helps the church to relate to others, and it’s big because it helps the church relate to herself in a new way. LAWTON: Nostra Aetate had a dramatic impact on the church’s relationship with the Jewish community in particular. Rabbi Noam Marans directs interreligious and intergroup relations at the American Jewish Committee. RABBI NOAM MARANS (American Jewish Committee): It was a game changer for how the Jewish people were to be understood by the giant of Western religions—Christianity. 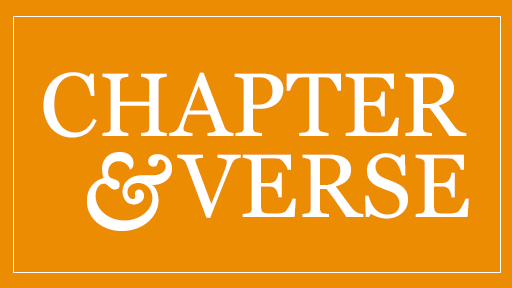 LAWTON: Nostra Aetate is Latin for “In Our Time.” The declaration was approved in 1965 in the Second Vatican Council where bishops were meeting to make a host of changes to Catholic teachings and practice. The document said the church can recognize truth in other religions and urges dialogue with followers of other faiths. A significant part of the declaration addressed Catholic teaching about Jews. For much of Christian history, the church had held what became known as a teaching of contempt: that all Jews were responsible for the death of Jesus and that God had therefore rejected them. Marans says this created an environment that led to the Inquisition, pograms, and Jewish ghettos. RABBI MARANS: Ultimately, these teachings of hate and animosity are going to lead to violence against Jews, and that’s exactly what happened. Jews lost their lives because of this teaching. LAWTON: McManus says in the aftermath of the Holocaust church leaders began to reexamine what was being taught. REV. McMANUS: Nostra Aetate has its roots in the shame and realizations of Christians after the Holocaust for what has been done to Jews. Following the horror of discovering in the camps what the Nazi project was about, seeing the flood of refugees of Jews to all of Europe, bishops, pastors, everyone become aware and ashamed and say we must begin to address this deep historical prejudice. LAWTON: Pope John XXIII was the primary force behind the change. 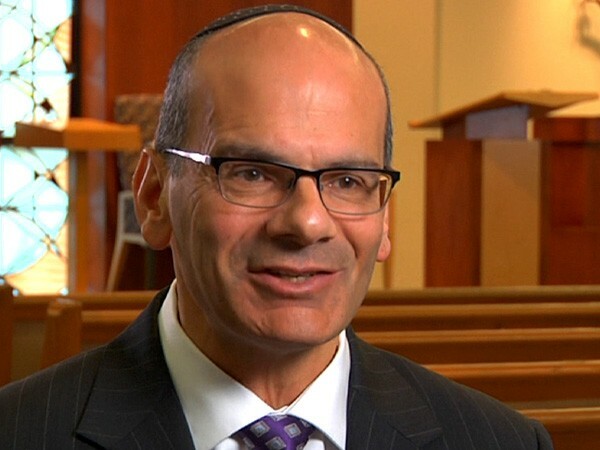 RABBI MARANS: When he was a papal nuncio in several capitals in Europe, among other things creating false baptismal certificates for Jews so they could impersonate Christians, and then he called for the Second Vatican Council and he made this relationship with the Jewish people, a reevaluation of that, part of that conversation. LAWTON: Through Nostra Aetate, the Council clearly repudiated the teaching of contempt. RABBI MARANS: The teaching of the church was now that the Jews could not be accused of the deicide charge, that Jews then and now were not be collectively responsible for the death of Jesus. Jews could no longer be presented as accursed. REV. McMANUS: What you hear on Sunday, what you hear on Holy Week, what you hear on Good Friday, what you hear on the sacraments, when you marry, when you bury, when you’re forgiven sins—if it’s anti-Jewish, it seeps into us like a kind of toxin. That kind of change in the liturgy has meant everything in the way Catholics understand Jews and Judaism. LAWTON: Pope John Paul II expanded Nostra Aetate further. RABBI MARANS: The first pope to visit a synagogue, the Catholics like to say since Peter. 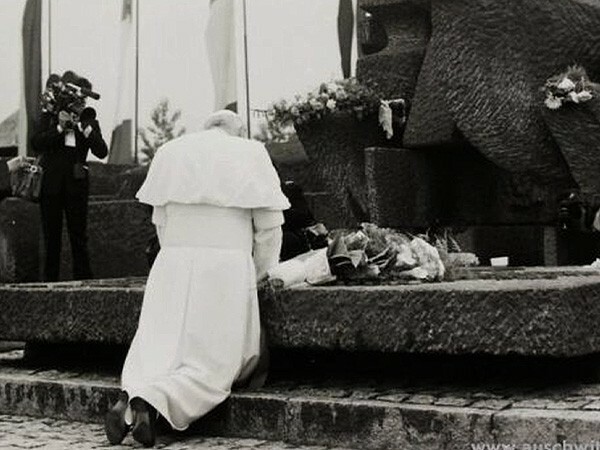 The pope that went to Holocaust sites and there on bended knee began to acknowledge the complicity of Christianity in the crime of the Shoah. REV. McMANUS: As John Paul would say later, “It isn’t enough to say that anti-Semitism in its many forms is not acceptable. Let me put it to you simply: anti-Semitism in any form is a sin and no Christian may have anything to do with it and call themselves a follower of Jesus.” He is that blunt. LAWTON: Catholic and Jewish leaders alike say Nostra Aetate paved the way for new dialogue and joint projects, all which built mutual understanding that continues to grow. REV. McMANUS: We no longer approach each other in dialogue with grievances, with complaints, with the desire to defeat each other. We come instead to say how do we work together? RABBI MARANS: The foundation enables the conversation to be among friends. It means if there are disagreements, they could be spoken about between friends. LAWTON: Many say Pope Francis has further solidified Catholic-Jewish relations. He had many Jewish friends in Argentina, including his close friend Rabbi Abraham Skorka, with whom he wrote a book. REV. McMANUS: He is the first pope in the 20th century, who did not see the darkening clouds over Europe from World War I or the horribleness of World War II and the Holocaust. He is the first one who is a truly post-World War II pope. 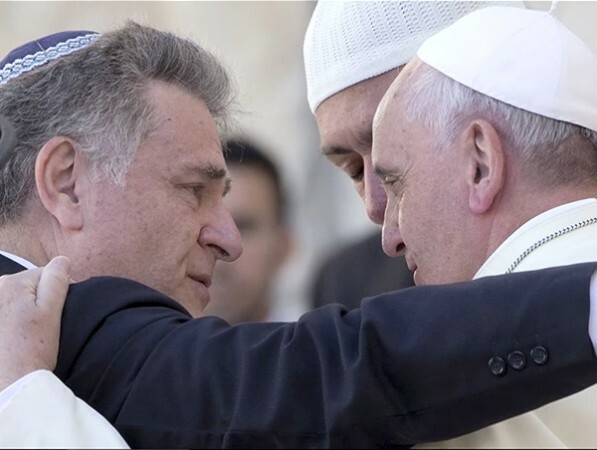 RABBI MARANS: Pope Francis is living proof of the success of the Nostra Aetate revolution. We perhaps have moved from revolution and evolution toward normalization. Ultimately, a much more healthy relationship. LAWTON: And in an all-too-often polarized world, many say healthy interfaith relationships are needed now more than ever. The 1965 Second Vatican Council declaration on the relation of the church to non-Christian religions transformed church doctrine about Jews and other faiths. Nostra Aetate had its roots “in the shame and realizations of Christians after the Holocaust for what has been done to Jews,” according to Rev. 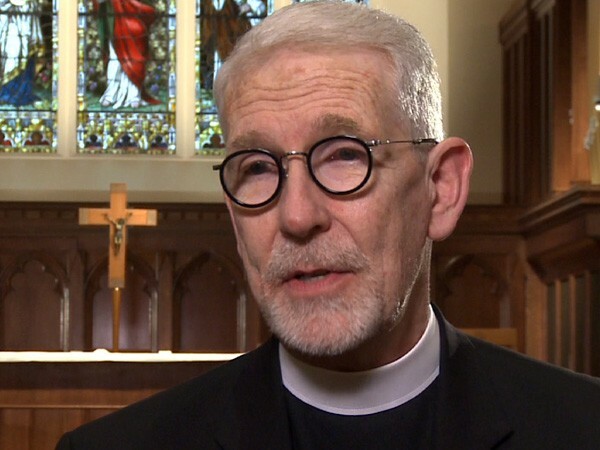 Dennis McManus, a consultant for Jewish affairs at the United States Conference of Catholic Bishops and a member of the faculty of the program for Jewish civilization in Georgetown University’s School of Foreign Service.